Abbot and Zander were really excited to meet popular characters, the Minions. PHOTO PROVIDED Gathered at the The Dr. Welch Workshop: A Makerspace at Penn College (under construction in the Carl Building Technologies Center at the college) are, from left, alumnus James Ryan, distribution technician for PPL; alumna Michelle Bennett-Knouse, journeyman electrician for PPL; Tracie Witter, PPL regional affairs director; Kyle A. Smith, executive director of the Penn College Foundation; and Elizabeth A. Biddle, director of corporate relations for Penn College. McELHATTAN — The Clinton County prison just got a big makeover. After more than a year of renovations, the prison’s major changes run the gamut, from completely remodeling inmate housing units to replacing broken furniture and appliances. prison has made, while comparing new spaces and appliances to pictures taken before renovations and during construction. Previously, the prison did not have a staff member manning the front entrance for civilians, so Rowley consolidated a few staff positions and redirected the funds for a manned front desk during visiting hours. Another change visitors might notice are the large, flat screen televisions mounted on the walls. Those screens provide important information for both visitors and prisoners, including visiting hours, press releases and schedules. Televisions are just one part of Rowley’s goal to technologically enhance the prison. “We’re tech-ing the heck out of this place!” he said. He also plans to add handheld devices called Notepads for inmates to access the law library, read books or study educational material. “It gives the detainee something constructive and rehabilitative to do, other than sit there and gamble,” he said. 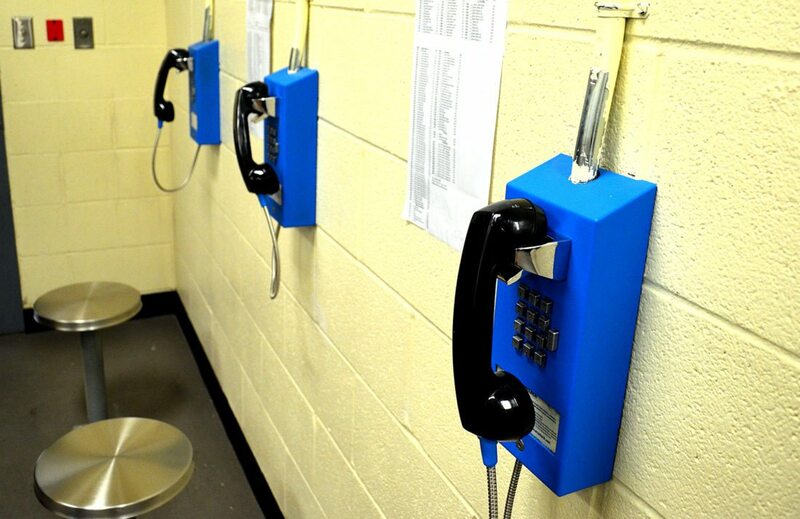 All entrances to different units in the prison now have a red plastic wall mount where correctional officers can swipe their Android phone to see and add to a record of previous officers who have made rounds there, as well as inmate behavior and any other important information relevant to the room. Soon, Rowley said, inmates will have wristbands that officers can scan with their Android phones, documenting when they leave a certain area and arrive at another. “We’re trying to upgrade everything to the best level of technology we can,” he said. In addition to improving conditions for inmates, the renovations have drastically improved prison staff working conditions. What was once a gymnasium only used by several inmates at a time, usually for pickup basketball games, is now a completely remodeled office block for inmate support services staff. Before the renovations, Rowley said, “Staff were going to the bathroom in cell blocks… they were working in closets.” But now, those working in support services have their own offices, two vending machines, a kitchen and bathrooms in a space where inmates are not allowed. 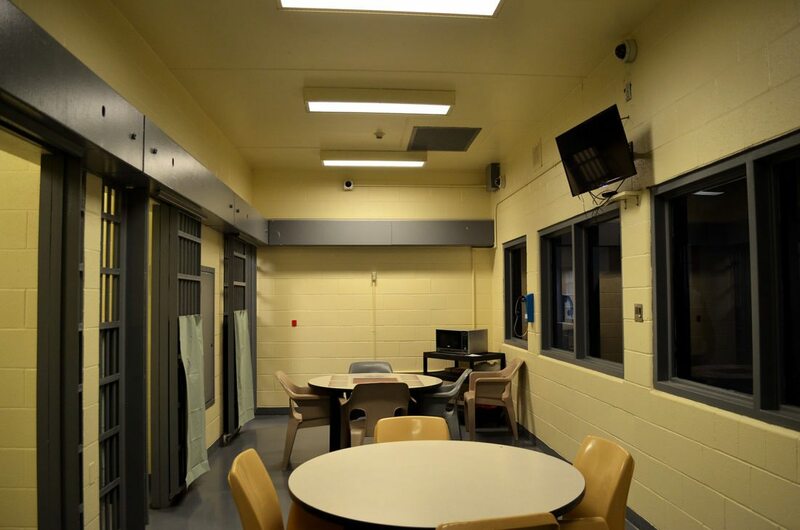 Several of the inmate housing units have been renovated, including a female unit. Rowley said the in-unit correctional officer desk was falling apart, so they replaced it, along with all the tables. Now, inmates can sit at stainless steel picnic tables to read, talk or eat. Rowley stressed that having tables and chairs that are bolted to the floor was an important safety feature of the new housing blocks. The renovations have also added laundry machines to each housing unit so that inmates can do their own laundry in their living space. 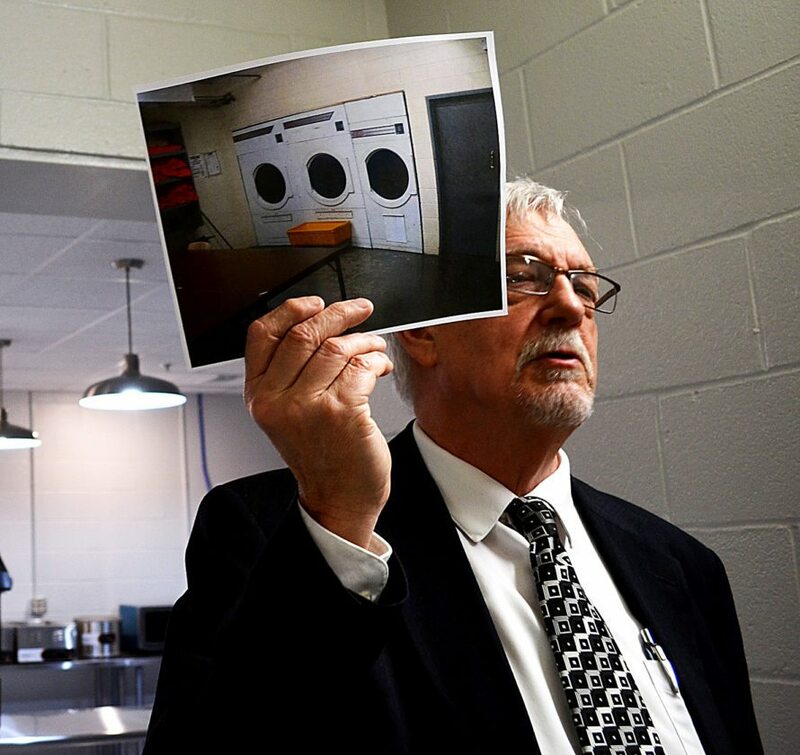 Rowley said putting the laundry units in each housing block saved space, allowing his crew to remodel the old laundry room into a staff kitchen, eating area and briefing room. Staff used to eat in the hallways before the renovations because there was no space anywhere else. Due to the increased volume of Homeland Security pickups, the county prison provides an office in which the federal department conducts their own hearings. 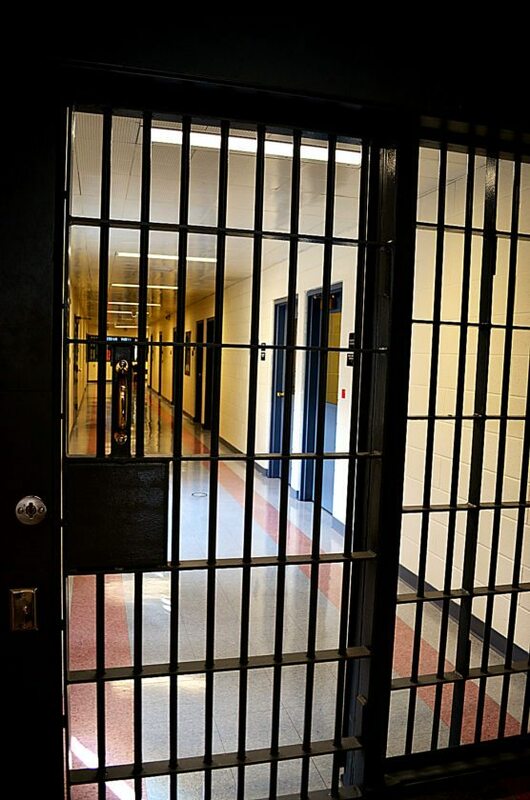 As you walk through the halls of the prison, you notice the hallways are bright and windows let lots of light in. 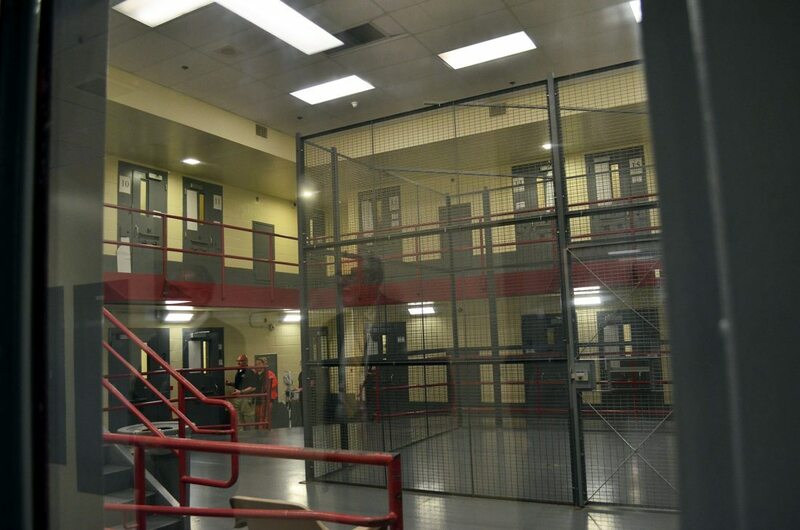 Correctional officers walk down the halls, chatting quietly, and inmates watch the tour group silently from their housing units and social areas. Rowley has made it his goal to run the prison fairly — he rewards inmates for good behavior and has provided better staff facilities and work schedules to improve morale. When he became the warden, there were no outdoor recreation areas because an inmate had recently escaped. He helped implement fenced-in outdoor recreation areas with picnic tables for inmates to enjoy on days with nice weather. The biggest issues facing prisons today? “It’s opioids and it’s mental health,” Rowley said. As The Express previously reported, the prison has invested in mental health treatment services for in-county inmates. Rowley said the new mental health counselor, Taylor Poorman, had to have her office moved from support services to the main hallway of the prison because she was seeing so many inmates. Renovations moved the medical services area from a small, overcrowded room to a brightly lit hallway with several private offices for treatment. Health Services Administrator Jody Baney said the change has been immensely helpful. “The security on the drug room is tight,” said the warden. With improved mental health services, Rowley said, more inmates are put on suicide watch, leading the medical team to more quickly get those inmates the treatment they need. At the time of the tour, six inmates were on suicide watch. Everything in the prison is now in accordance with the Americans with Disabilities Act (ADA), including showers, doorways, the kitchen and beds. One of the renovated housing units will also become a “special-needs unit” for inmates who have disabilities that exclude them from being with the general prison population. While the group was touring, kitchen staff were readying lunch for the inmates. Brand new, stainless steel appliances and paneling line the walls of the kitchen. The new design is much more sanitary, explained architect Peter Folen of the EADS Group, because stainless surfaces can easily be cleaned. 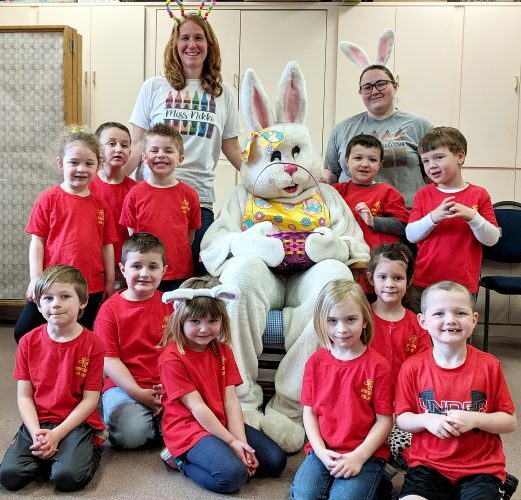 When the kitchen was in the remodeling stages, architects and contractors found so much mold and decay that some of them said they would be sick. Rowley, as always, has big plans. In the next month, he is breaking the modified housing units into three different areas: the aforementioned special needs unit, the behavioral modification unit (for inmates who are physically dangerous or act out) and a protective custody and medical isolation unit. The last unit will hold detainees who must be kept separate from a co-defendant who might try to harm them and those who have serious medical problems and must be kept in isolation. In the fully rewired surveillance room at the prison, the warden asked one of the employees what he thought of the changes. “Oh much better, a lot easier!” the man replied.